Viewer Discretion Advised: Working around death, it’s easy for me to forget that what I view as an interesting historical fact is considered grotesque by most accounts. This little fact might fit under that “grotesque” category. In fact, my mother said it made her want to barf. So, fair warning. Don’t proceed IF the morbid piques your gag reflex instead of your curiosity. This is a real thing (as you can see from the picture below). And, yes, it’s rather morbid. 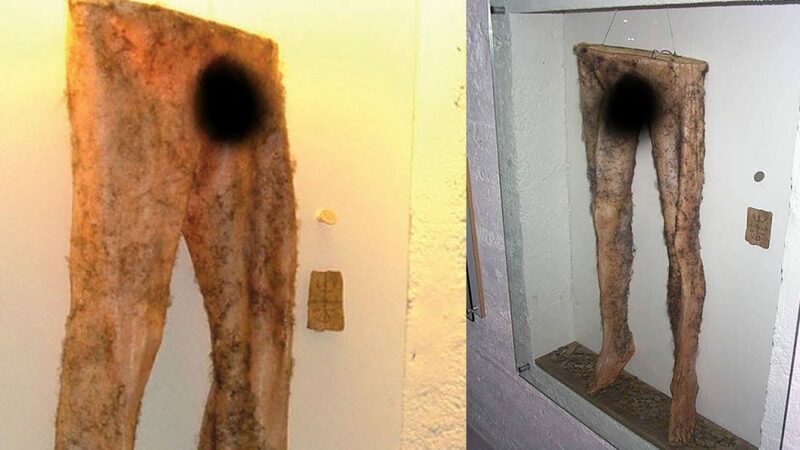 If you want to make your own necropants (literally; nábrók), you have to get permission from a living man to use his skin after his death. After he has been buried, you must dig up his body and flay the skin of the corpse in one piece from the waist down. As soon as you step into the pants, they will stick to your own skin. A coin must be stolen from a poor widow and placed in the scrotum along with the magical sign, nábrókarstafur, written on a piece of paper. Consequently, the coin will draw money into the scrotum so that it will never be empty, as long as the original coin is not removed. To ensure salvation, the owner has to convince someone else to take ownership of the pants and step into each leg as soon as he gets out of it. The necropants will thus keep the money-gathering nature for generations. Imagine that Bob believes that necropants will bring him wealth. Imagine that Bob asks his buddy Rich, who’s dying from dysentery, for his skin. BEAR WITH ME AS I TURN TO MY PHILOSOPHICAL DARK SIDE: What I find interesting is how necropants must have seemed like an entirely logical way to gain wealth to whoever used them. I mean, you’d really have to believe in something to wear the skin of your friend and stick money in his scrotum. It was logical because they believed in an unseen world that controls and dictates the seen world. And before we judge Bob, or the person who gives money to televangelists, it’s important to remember that we all throw money at things that don’t make sense. Bottled water for example. How is bottled water a multi-billion dollar industry? Because our culture values convenience above and beyond most other considerations, including the environment. Or, leather. We wear the skin of dead animals because we think it’s fashionable, protective, etc., when we know that there are better, more cost-effective, more durable materials than leather (that examples a little too close to home). In some weird way, we all wear necropants. So, yes. 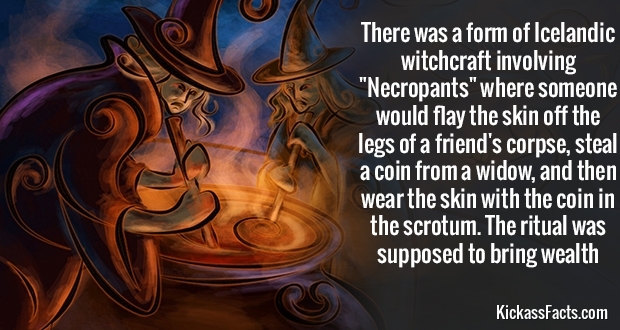 Necropants are weird. But we all do weird things with our money. And most of us do weird things to try and get money. 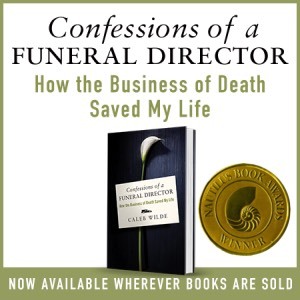 This entry was posted by Caleb Wilde on August 3, 2018 at 12:48 pm, and is filed under Aggregate Death. Follow any responses to this post through RSS 2.0.You can leave a response or trackback from your own site.